"Shubham Creations" was established in the year 2010 as a leading manufacturer, trader, wholesaler, Distributor and supplier of Traditional Indian Jewellery such as Necklace Sets, Pendant Set, Designer Bangle and Bridal Earring. This Proprietorship Firm is striving hard to achieve all the company goals and catering the clients’ diverse requirements sufficiently. The products we offer in industry are procured from some certified and legal vendors of the industry, who have got years of experience in their respective fields. Our products are widely demanded and praised among the clients for their purity, intricate designs, smooth edges, shining finish, lustrous look and durability. In order to ensure the reliability and flawlessness of the products, our quality inspectors stringently test every product on well defined quality parameters. Our sound infrastructure facilities and well trained professionals, help us in delivering the products within the prescribed time frame. Clients can avail our range at most affordable rates in market. 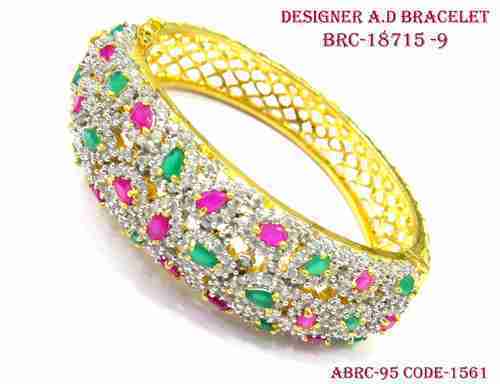 Subham Creations is a Leading Manufacturer, Exporter, Supplier,Distributor and Wholesaler of wide range of American Diamond Jewellery, Antique Jew,Polki Jewellery, Imitation Jewellery, Fashion Jewelry and Fashion Bangles. We do bulk sale world wide i.e. UK, USA, Canada, Dubai, Malaysia etc.